Excitement filled the air upon waking up on February 24, 2008, a Sunday. 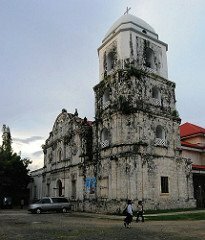 To meet the family’s Sunday devotion, we attended dawn mass first at the Cathedral of Talibon and hurried home immediately after the mass for we will be fetched by a service of Alturas at past 6 in the morning. Beach! Beach! Beach! We were bound for the beach! 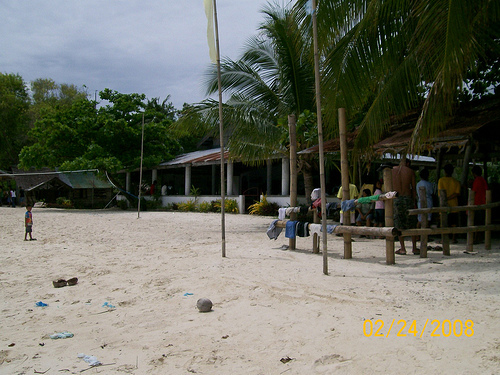 To a beach in Anda; a place in Bohol blessed with white sand beaches and still relatively unknown to the world. When we arrived from church, the double-cab service of Alturas was already waiting for us in our home at San Agustin, Talibon. Everyone panicked! Swiftly, we loaded our things to the cab; swim wears and all, including plates, plastic tumblers, spoons and a few “baon” (packed food). 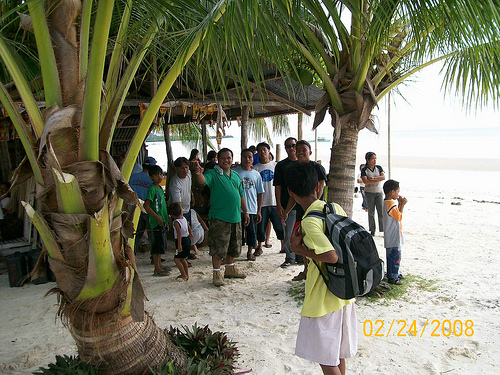 Our first stop was Ubay, two towns away from Talibon. 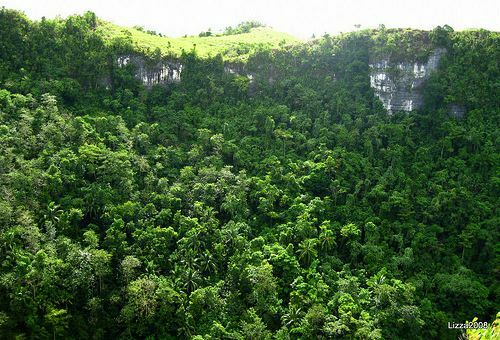 It is about 26 kilometers away from our hometown, lying at the northeast side of the island. 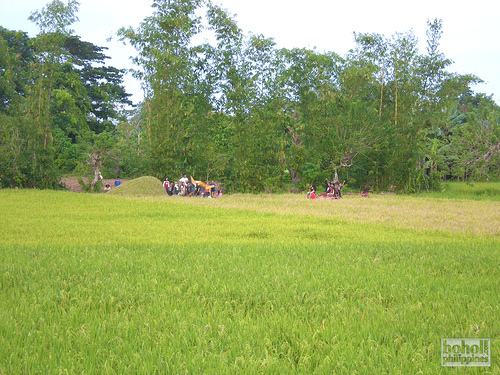 It is the place where Alturas’ Feed and Rice Mills are located. Alturas, by the way, is the biggest business establishment in Bohol having 3 malls in Tagbilaran (Marcela, Alturas Main, and ICM), a mall in Talibon, and other subsidiaries such as the Rice and Feed Mills, and more. 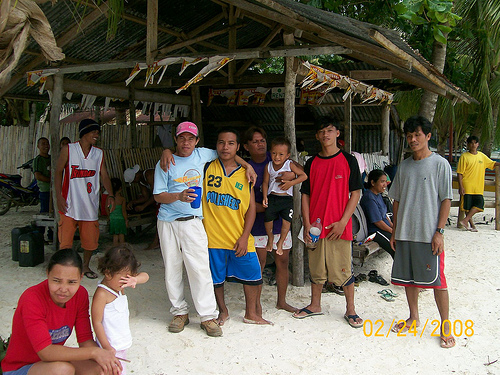 My husband works at the Rice Mill (which he says is the biggest in the whole Philippines) and yearly they, with their families, are treated by the owners of Alturas to a beach outing. 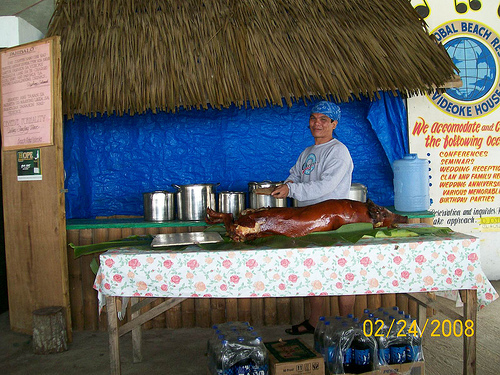 Food and drinks (and that includes lechon!) 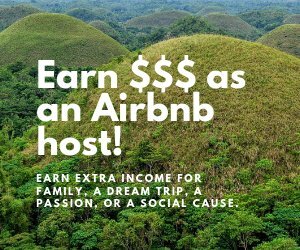 are provided as well as rides to and from the beach. We dropped at the Plant to be with the others. An eagle (a very big truck with sides that can be opened like eagle’s wings) was provided for the other families. The truck was full! Our ride and the truck left the Plant premises after the food were loaded to the truck. Some male workers rode the back of the double-cab. Traveling to Anda, we passed by the towns of Alicia, Candijay, and a few barrios of Guindulman. Along the highway, you will see verdant rice fields, banana and coconut groves, hills and mountains, aside from resident houses. In Trinidad, Guindulman, we turned left at a junction that leads to Anda. The road from Talibon to Guindulman is very good; cemented all the way. 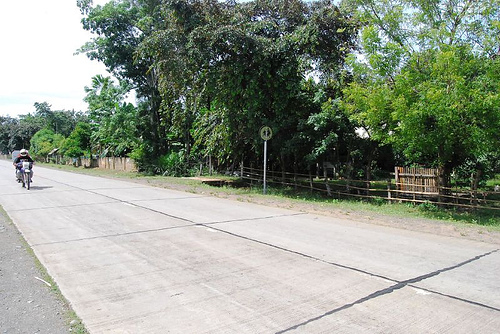 From the junction to Anda proper, the road is also cemented though a short stretch (still part of Guindulman) is still a dirt road. Our ride separated from the eagle truck when we arrived in Guindulman. 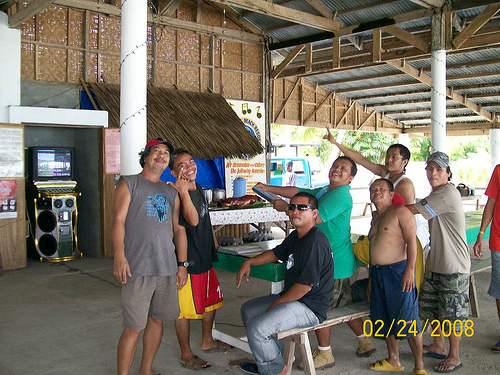 We went to the town’s market to buy fresh seafood as additional provision. The market was alive and busy. 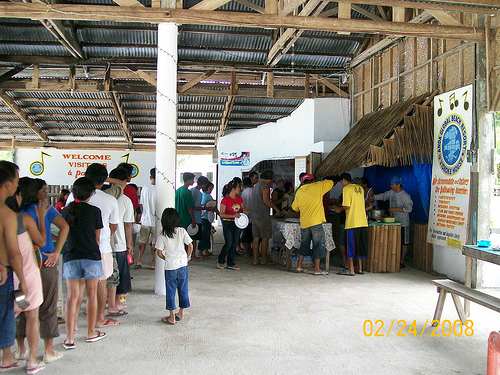 It is their market day (some towns of Bohol have different market days and not all necessarily fall on a Sunday). Vegetables and fruits abound, especially “lakatan” ripe bananas which are my favorite! After a few minutes, we left for Anda. We arrived at the town’s Poblacion, turned right on a cement road, another turn, and voila! . . . we were at the beach! The whole trip took, more or less two (2) hours of leisurely driving including the stint at Guindulman. It is my first time to bathe here. The beach is so accessible. We went swimming before in another Anda beach but we went thru a very rough and narrow road and down a steep portion to reach a sandy beach. The beach there was also beautiful though. Very clean and cool, yet the sand was not fine. 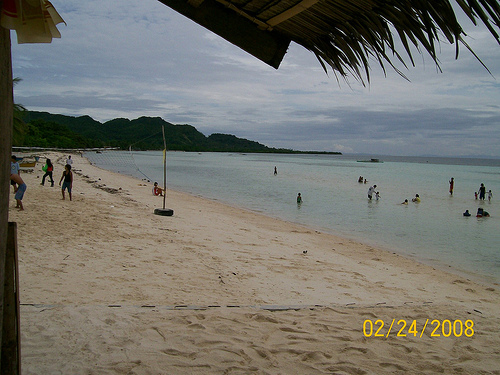 Anda Beach, the long stretch of white sandy beach near the church and municipal building, is breathtakingly beautiful with the Anda mountain ranges in the background and the silhouette of an island in the distance. 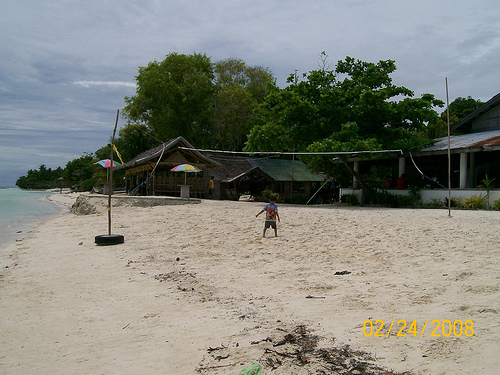 Coconut palm trees fringe the public beach which is devoid of any cottages or buildings. 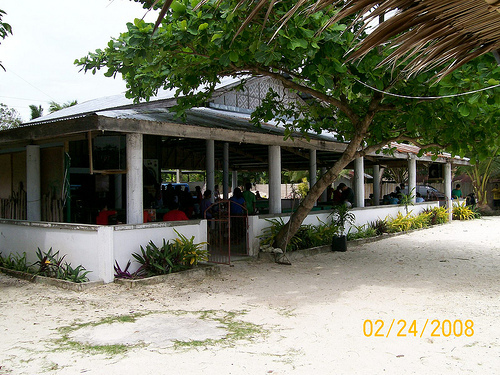 From the church and municipal building stretches an open area, a “plaza” that leads towards the shoreline. 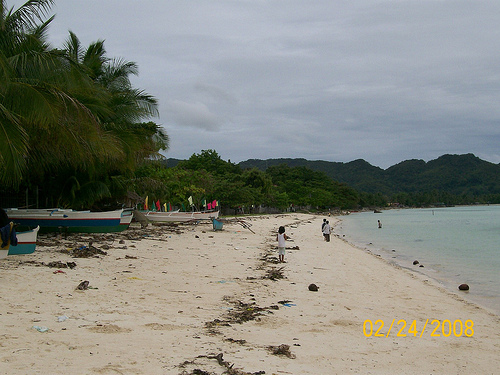 A few meters to the right (when one is facing the sea) are privately owned beaches. The water near the shoreline is clear. This is what other writers describe as “crystal clear” for you can see through the water and notice the white sand beneath that spreads more than a hundred yards towards the deep. There are no sea grasses or stone formations beneath. White sand spreads up to the point where the water looks darker, which signals that the water there is deeper. And the sand! The sand is so fine and very white, so soft to the touch! The manager of Rice Mill mentioned that the sand is like that of the famous White Beach in Boracay Island although the length of the sandy portion is shorter in Anda. But it was enough for me. Looking at both sides of the beach where I stood, the white sand beach stretches out for more than a hundred yards. Beautiful! 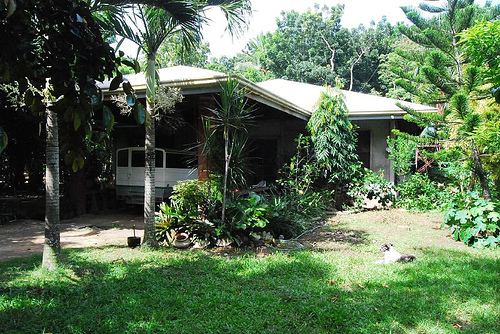 The Rice Mill group was booked at the Anda Global Beach Resort & Videoke House which lies along Anda Beach but privately owned by Mr. Edil Tan, a former vice-mayor of Anda. The resort is only a few minutes walk from the public beach and the sand there is part of the long stretch of pure white sand, very soft and fine to the touch. 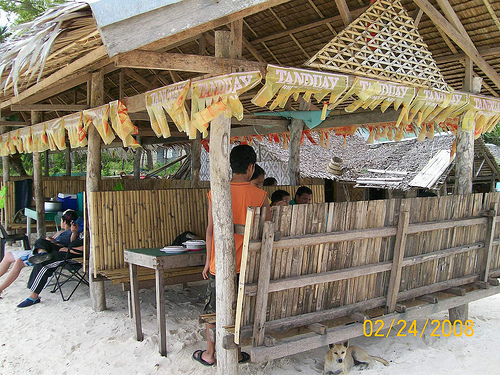 The place was exclusively booked by Alturas for a minimal amount of P1500.00. We availed of the cottages and a covered yet open-sided pavilion designed for functions and provided with long tables and benches. The resort has a videoke system which caught the fancy of the employees. For five (5) pesos per song, the employees and some of the wives took turns belting out their favorite songs. My husband sang and got a score of 100, much to his delight yet to the consternation of his subordinates. 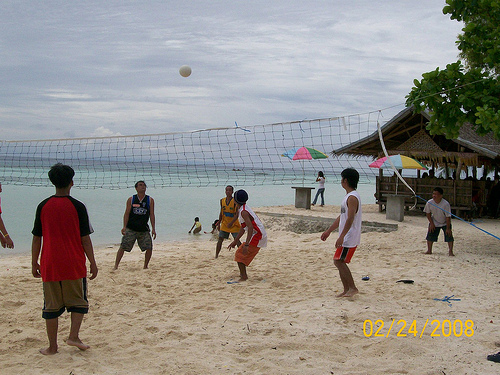 The more active employees and members of their families plus me and my kids, enjoyed playing beach volleyball. You will not fear falling or scraping your knees for the sand is very soft and fine. Others, especially the small kids were off swimming immediately upon arrival. Mealtime! It was orderly. 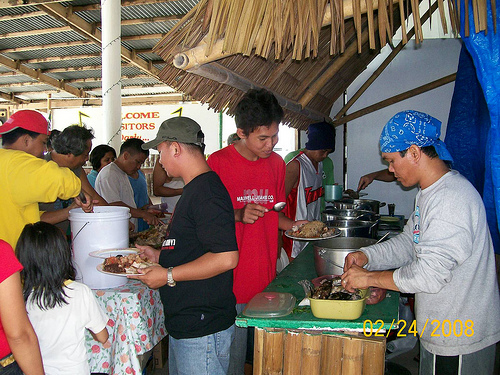 The lechon was cut into small pieces, and with the other foods, was divided equally among the employees. There were plenty left over after the rationing, so the employees were told to get more. 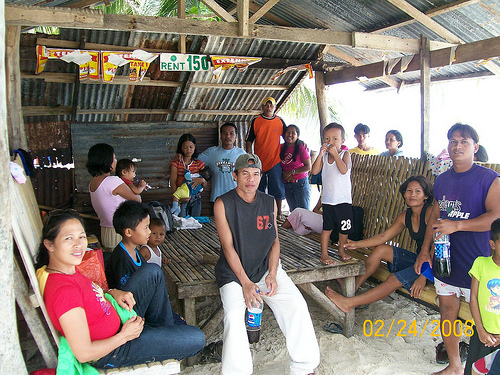 Bottles of Pepsi were distributed and also Tanduay, a locally brewed hard drink. After a bout of swimming and singing, my husband called it quits! We have to travel for two hours back to our hometown and he wants us home before dark. We left ahead of the group who, high with the spirit of Tanduay, continue to belt out their chosen songs. The queue of singers was long. Not one showed the interest of leaving, including the truck driver. Drowsy with sleep, the trip back was uneventful but the memory of the pure white sand and cool water of Anda Beach lingers on. O, how I wish they were on my doorstep!